JOIN US FOR 1 SPECIAL DAY OF NETWORKING & MOTIVATION – TAKE YOUR REAL ESTATE KNOWLEDGE TO A WHOLE NEW LEVEL! Don’t Miss Our Complimentary Real Estate Expo with Realty411 Magazine, the Nation’s Original Realty Investor Magazine and Expo Company Founded by a California Investor. *NON-Stop Tips for Real Estate Success ~ Make This Your Year! *We Want & Can Help YOU Succeed. Bring Lots of Cards. DISCOVER STRATEGIES FROM SOME OF THE MOST SUCCESSFUL INVESTORS IN THE NATION TODAY! Laura Al-Amery has been a real estate investor and mentor for almost 30 years. She has been a pioneer of several real estate investing strategies before they became mainstream, from wholesaling to raising private money. Everything she teaches has been developed from personal experience. Her focus today is to streamline the real estate investing business by simplifying the process while exponentially growing the financial results. In other words, how to truly live a financially and active lifestyle, without trading time for dollars. Her signature program is Rapid REI Riches. Mr. Hetsler has devoted his career to advising business owners and attorneys on all things related to business valuation, forensic accounting, 1031 exchanges, commercial real estate (Self-Storage specifically), financial planning, and mergers/acquisitions. He is the Managing Director of Hetsler Mediation & Valuation, Inc., a uniquely specialized accounting and consulting firm dedicated to providing business valuation, forensic accounting and Mergers & Acquisitions (“M&A”). Robert has valued businesses across all industries for divorce, partner or shareholder disputes, Estate & Gift tax, buy/sell agreements, dissenting shareholder actions, M&A’s and Employee Stock Ownership plans (“ESOP”). Business valuations, 1031 Exchanges, forensic accounting, income producing property and retirement division through the preparation of Qualified Domestic Relations Orders (QDRO’s) are the five key areas of Robert’s innovative financial practice. Robert has testified in numerous courts as an expert witness in, retirement division, business valuations and forensic accounting. He has also been appointed as a neutral business valuator in litigation cases. Prior to focusing all his time on the unique practice areas above, he was a civil/family mediator where he conducted over three thousand mediations ranging from high conflict business disputes to high net worth divorce cases. Robert operates as an M&A consultant to business & real estate owners wishing to liquidate or expand their business via selling their business or acquiring an existing business’ or real estate. He has been involved in many transactions in industries such as self storage, billboards, manufacturing, technology, legal, construction, medical/dental practices, etc… as the lead consultant ensuring the transaction, along with all the intricate details, closes timely and smoothly. HIs life passion has been real estate with his first personal transaction involving billboards. He now owns nine separate storage facilities, several other commercial properties and six investment homes. Fourteen years ago, the tax attorneys to whom Robert worked with in the business valuation world, asked him to operate as a Qualified Intermediary which was directly related to his passion for real estate investing. It was the perfect storm in that he could speak with like-minded people and have fellow investors as clients, which is the ideal opportunity to combine his passion with his education and skillset. Thereafter, Robert has spent most of his professional life working in and around real estate as an investor, qualified intermediary, replacement property expert, and real estate agent. After Law School, he worked for a real estate attorney handling closings for three years. The results were a countless amount of national connections around the Nation from every possible angle in real estate. Robert obtained a bachelor degree in Accounting along with an additional year of postgraduate studies in Accounting and Tax from University of North Florida. He also acquired a Doctorate Degree in Jurisprudence from Florida Coastal School of Law. Finally, Robert is an active member of the, American Institute of Certified Public Accountants (Personal Financial Planning Section), the National Association of Certified Valuators & Analysts, and the Florida Institute of Certified Public Accountants (Valuation & Litigation Section). Ted Thomas has developed in-depth training programs that show you step-by-step how to profit from tax lien certificates and has been the nation’s most prolific educator on this top. Ted has spoken in front of up to 3,500 people, and has also spoken in other countries. Help us welcome this Legend in Real Estate! From struggle to success, Justin Ford truly lives the saying “It’s not how to start but how you finish.” At the age of 19, with his life in disrepair, Justin made the critical decision to turn it all around. Now at the age of 34, Justin has become a successful Entrepreneur, Business Owner, Real Estate Broker, Investor, Motivational Speaker, TV talk show host, Author, and Mentor. He has earned numerous achievement awards, and demonstrates daily that talent, drive and ambition really do lead to success. Justin also excels as an inspirational youth and marketplace speaker. People can feel his powerful presence when he walks into the room. He wants to make a difference, and he takes that responsibility extremely seriously. Justin’s passion and desire to see people rise to success leaves a lasting impact as he challenges all to become the champion they were created to be. ARMANDO MONTELONGO, THE FORMER STAR OF A&E’S “FLIP THIS HOUSE” IN PERSON! Armando is the ORIGINAL real estate reality star, and is consistently ranked as one of the most successful Hispanics in business. He is visiting us from San Antonio, Texas! Don’t miss the very rare opportunity to learn directly from the founder of a company who has invested over one billion dollars. Armando has been doing this business longer than most people in the industry. This his passion and it shows. Starting off with no credit, experience, or knowledge, Armando is now known as one of the top real estate investors in the country. How did he go from living in his family-in-law’s garage to owning a multi-million dollar company? Find Out Here! Residential real estate and in particular, flipping houses, is the most popular way to get started for anyone looking to get into the property game. Armando got his start in real estate by flipping houses and creating his system to gain the highest profit possible. Even though he has branched into other business ventures, Armando is still very active in residential and commercial real estate. 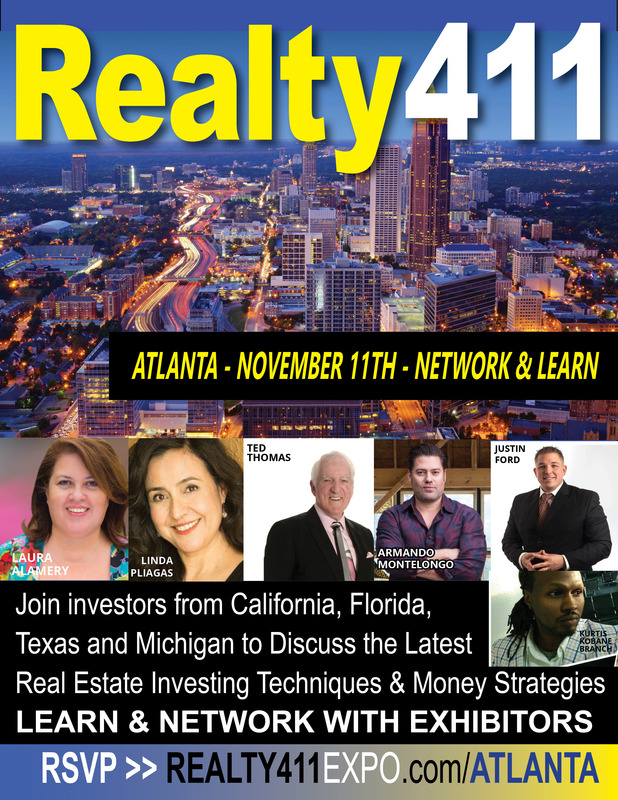 Be sure to get your hands on our new release of Realty411 Magazine, Private Money411 and REI WEALTH either by mail, or by picking up a free copy at one of our events! San Jose Real Estate Weekend Expo – JOIN US! FREE RE Expo in Silicon Valley!